The RGB6V2AP is a plenum rated, hybrid audio and video cable for permanent installation applications. 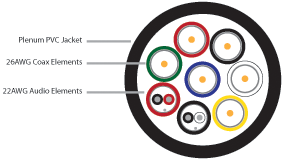 The six video elements are constructed from 26AWG miniature 75Ω coaxial cables that are rated to 1GHz for high resolution video transmission. Audio elements are constructed from two 22AWG shielded twisted-pair cables. Each audio and video element is uniquely color coded for quick identification. The outer jacket is extruded from a plenum PVC compound that is easy-to-strip and more flexible than typical plenum rated compounds. Plenum PVC Pair Jacket .108" O.D. Plenum PVC Coax Jacket, .102"
Impedance Return Loss DC Resistance Capacitance Velocity of Prop.